I first met Ahmad Ali Jafari in the Villawood detention centre in mid-2012 while conducting art lessons with the Refugee Art Project. Though he had no experience of making art, Ahmad was a willing and enthusiastic participant in our class. He was a short, compact man with a slightly rounded belly, who had an air of tidiness about him. His hair was thick, glossy and straight, and was cut in such a way as to appear coiffed. We amongst his friends developed a hand action to describe this, in which the middle and index finger would descend swiftly from the left edge of the hairline and sweep down, across the right side of the forehead, a gesture accompanied by a swishing sound of the lips. This became so strongly associated with Ahmad that instead of pronouncing his name we would perform the swish that described his appearance and which encapsulated something of our affection for the man. 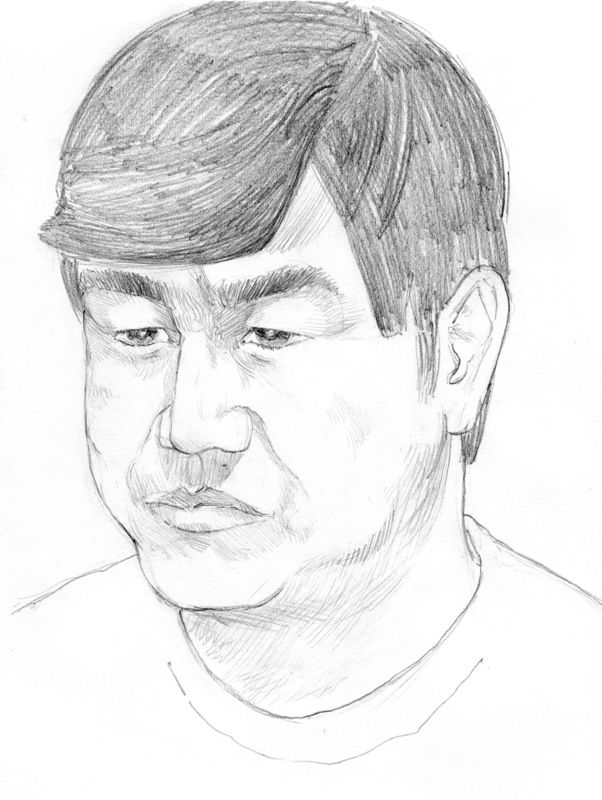 Like so many of those detained at Villawood, Ahmad had undergone a long and arduous refugee journey. A member of Afghanistan’s Hazara ethnic minority, his family fled their country in 1997 after his father disappeared at the hands of the Taliban. They moved across the border into Pakistan, finding an uncertain home in the city of Quetta, where over half a million Hazaras have lived a sort of half-­life, waiting for a time when they could return to their country. Once a safe haven for refugees, Quetta has become increasingly dangerous in recent years on account of the Lashkar-­e Jangvi and other radical groups who target Hazaras for their Shia faith. Most Hazaras live in two designated areas, ‘Hazara town’ and the suburb of Mehrabad/Mariabad, which have become ethnic and religious ghettoes on the western and eastern edges of the city. Ahmad fled Pakistan for Europe at the age of 18, travelling for many months in trains, boats and hiding under trucks – through Iran, Turkey, Greece, and France before arriving in the UK in 2005. Once in Britain, he applied for asylum, enrolled in courses to study English and undertook voluntary work with a refugee support group in Gloucester. In 2009, British authorities rejected Ahmad’s claim to refugee status and forcibly deported him to Afghanistan, as they did many other Afghans seeking refuge. Homeless in Kabul and with no remaining relatives in any part of the country, he journeyed to Pakistan to be reunited with his remaining family. Though he found work in Quetta and was engaged to be married, he again experienced the precariousness of life as a non-­citizen in a volatile environment, when the Taliban beat him and stole his motorbike. Finding the assistance of a people-smuggler, Ahmad made a second escape, this times to Australia. After arriving here, Ahmad was placed in community detention as his refugee claim was processed. Like most asylum seekers, he preferred this to a detention centre, as it gave him a sense of freedom and autonomy. A photo of Ahmad outside the Sydney Opera House, bathed in afternoon light, is a study in contentment. This was abruptly terminated, however, when the Department of Immigration ordered his return to detention after confusing him with someone of the same name who had served a prison sentence in the UK. It was a fantastic error, given that Ahmad was never incarcerated in Britain and had no police record. Once in detention, he obtained his own police clearance to prove his innocence and to show that he had been falsely detained. Yet immigration officials had no interest in releasing him, ensuring he would stay in Villawood for twelve months. A few weeks before he died, he drew a single page comic. It tells the story of this incident, relating his despair at the administrative blunder that had taken away his freedom. For reasons of privacy he adopted a pseudonym, going under the name of ‘Batur’. Ahmad was a kind person with a gentle manner. Though you might guess him to be in his mid­‐thirties (a whole decade older than he was) his smile was that of a much younger man. He seemed highly conscientious and took evident pride in serving others. No sooner had we arrived in Villawood than he would be on hand to request our orders for water, tea, juice or coffee. He made a delicious, hot, frothy dhoodh patti (milk tea) much like you would taste in Pakistan. We teasingly called him chai wala, (denoting those who make a living from preparing and selling tea in roadside stalls) to which he would laugh and insist that he was only fulfilling the duties of an honourable host. 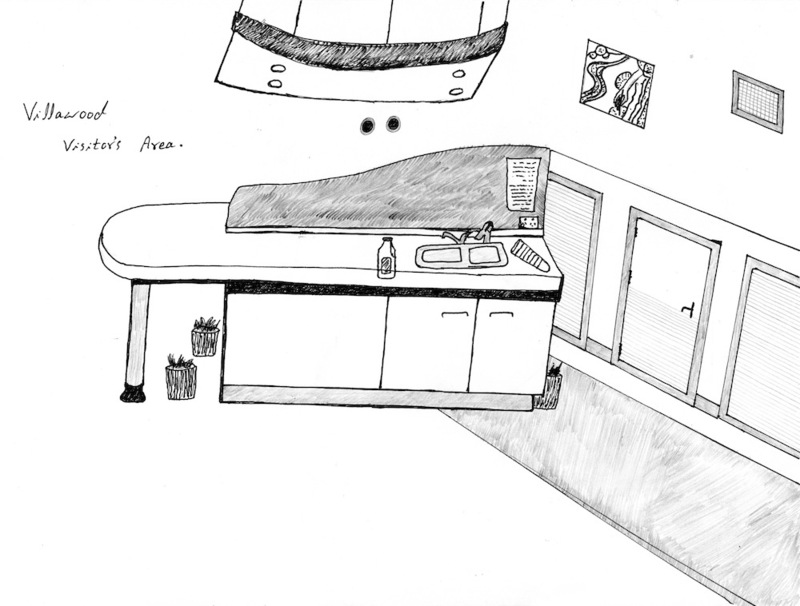 Perhaps reflecting on this joke, he drew the kitchen area of the visitor’s section at Villawood, where so many teas were prepared. Ahmad wrote poetry in Urdu, which was not his first language but in which he was nonetheless fluent. He would sometimes recite a couplet or jot it down on a napkin, which was another one of his endearing habits. I think because he didn’t consider himself a serious ‘artist’ he would often draw or write on the disposable objects at our table, utilizing napkins or the sides of Styrofoam cups. One day he gave me a clutch of poems, which I translated with the assistance of his friends in detention. When scanned in English, conventional Urdu poetry can seem breathless and melodramatic though it in fact utilizes a flexible and highly sophisticated range of tropes and metaphors that relate to the themes of love, desire, loss and separation. The poet/lover experiences an ardent and unfulfilled yearning for the figure of the beloved, which could be a real person, an ideal theme or representation of God. This opens the poem up to different possibilities of interpretation. Whilst the subject of loss can have a mystical connotation, evoking humanity’s distance from the divine embrace, it may also touch upon real, worldly calamities and misfortunes. In Ahmad’s poems, there are strong allusions to his status as a refugee in detention whose future was unresolved and whose aspiration to live in safety had not yet been realized. But there are more pains in my heart – thousands of sorrows. dukh dil mein aur bhi hain, gham bhi hazar hain. The hope that was in my heart, unknown, was just a dream, I thirsted by that garden, which was worse than any desert! Main jis gulshan ka piyasa tha, woh sehra se badtar tha. If you had spoken to me with love, everything I had was yours, If you had put me to the test, I would not have been disloyal. Agar tu pyar se kehta mera sab kuch tumhara tha, Mujhe tu azman leta, main itna bewafa na tha. The heart is that strange city of loyalty which, as now, though the path leads close to you, is still searching. Dil wo gharib shahr-­i wafa hai ke ab jaise Tere qarib reh ke bhi teri talash hai. The circumstances of Ahmad’s case are depressingly common for Afghans and other refugees in Australia’s detention system. Despite fleeing his country (and neighbouring Pakistan) not once but twice, he was caught in the same convoluted net of legal rejections and appeals that our government enforces on asylum seekers to show our ‘toughness’ towards those who arrived by boat. That an inept official had falsely identified him as having a criminal record put Ahmad under enormous added stress. Despite his composed appearance he was grappling with depression, anxiety and sleeplessness, for which he required daily medication. In the evening of 20 June 2013, he suffered a fatal heart attack at the age of 26. Whilst it is no doubt possible he had an underlying and undiagnosed heart condition (which is the assumption among medical staff and police for those who die so young of heart failure) there is the unpleasant and undignified reality of his treatment at the hands of Villawood staff. According to Ahmad’s roommate and a friend who witnessed the event, his initial complaints of chest pain were mocked by a SERCO officer who judged him to be pretending. Though he was lying on the floor of his room and in obvious distress, the person in charge decided he was putting on an act and dismissively laughed about the whole thing. It was only as Ahmad screamed and his body turned black that Villawood staff made the decision to send for an ambulance. Throughout this ordeal, Ahmad’s friends stood by in shock, distraught and powerless to do anything for him. The ambulance staff worked on him for about twenty minutes but it was too late and he was dead by the time they had him in the vehicle. That he was shown so little dignity in a time of intense suffering has magnified the grief of everyone who knew him. We miss him dearly and regret that a life of courage, generosity, humour and perseverance should have ended in such desperate and horrible circumstances. Safdar Ahmed is a Sydney-based artist and academic. He works mostly in the mediums of drawing and comic, and is a founding member of the Refugee Art Project. So utterly tragic and such a waste of a beautiful life. I live in Adelaide, but I have visited Villawood many times. My friends have made tea in that kitchen area. It’s possible that I was visiting at the same time that Ahmad Ali Jafari & his friends were there. Through oppressive & cruel processing systems, through unforgivable neglect, Australia has lost another opportunity to value & support a person of great endurance, a gracious & good man. Along with his friends, we are all poorer for his loss. Thank you Safdar Ahmed for telling us so dearly about your friend & student. i read the young Afghan poor boy story i shocked why always it happen to Afghan people in Afghanistan killing by Taliban , Government,in EU countries in detentions and prisons ,in Autralia and other no body thinking that afghan are also human been why they are suffering and why they die like that very easily where is the Human rights? we want the Human rights to surch why it happened ? then they have to take action against ,please stop punishments afghan people for nothing ,if there is no problem in the country no body want to leave the homeland, family, every things pay a lots of money and pass difficult ways in a very difficult situation , coming by walking, buses,trucks, boats, cars, trains it is not easy still what we can find final? die, prison, detention, waiting in the camps in bad situation of live for nothing. Older they die, young’s become old,children becoming young, people getting married and have baby . This is such a sad story… the capacity for callousness in the way we treat the unfortunate and destitute never seems to diminish. And I can see the faces of the people in this sorry story so well, the smirking SERCO fool, and the bewildered detainees looking on. Ahmad Ali Jafari perpetually persecuted no longer, but the injustice will forever remain. Sometimes I wonder when all of this will stop hurting. Then I remember that I don’t want it to stop. Not until we have justice for our dear friends. Thanks for this, Safdar. I am very saddened by this story, but I am glad that you wrote this eulogy. Thanks for pointing that out Liz and I’ve made a small correction. All the best, Safdar. I am so warmed by Ahmad’s poems, though they express such pain and sorrow they still proclaim the quality “loyalty”, seemingly so rarely honoured these days. I am so sorry Ahmad suffered so many indignities, even in his last moments on earth, yet I pray that we can continue to foster faith in the reality of, and the potential for, human decency. Thank you, Safdar.